If you're a Destiny player you may have run across one of these red boxes and never thought anything of it. But some creative players have taken notice and they sure do have some funny theories about what this seemingly random red box is. 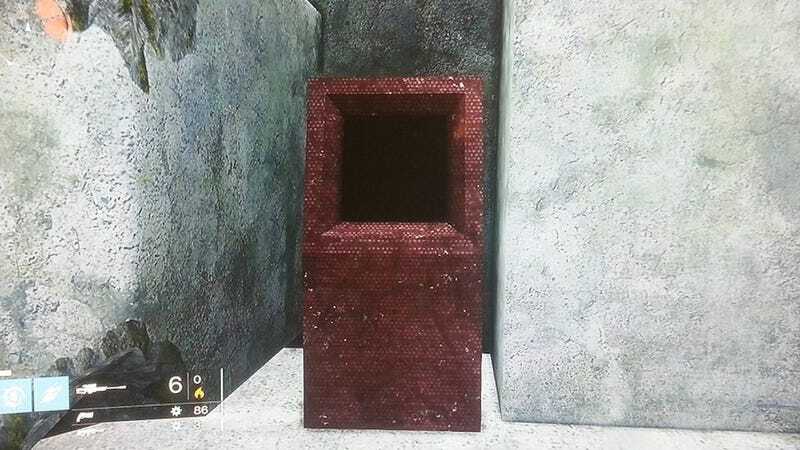 This isn't the same as the Red Box farming area—one of the many replacements to the original Loot Cave that players have discovered—it's just an inconspicuous-looking box probably placed there for visual effect, right? According to its discoverer, Cloud Mac on the Destiny forums, it can be found outside of the entrance to Destiny's first raid area—the Vault of Glass. The box appears to be copper. The red lid is dented, one hinge shattered. Inside waits a small quantity of the finest, driest powder, more brown than gray, more blue than green. The greatest minds in creation make quick work of the material. The powder is weighed by the grain, and studied close, and remembered. One hundred billion bits of near-nothing reside inside the copper box, all of them tiny and nearly spherical, all etched with the outlines of continents and islands and icecaps. Each sphere represents a planet, and some of these tiny globes match known worlds. There is one Earth and one Mars and a Venus too. The box holds renderings of every habitable world in the galaxy. "The box is a message. The message is the minuscule nature of the box's cargo. It's the image of one hundred billion worlds barely filling two hands." But if so, who is delivering this message? What vastness do they wish to impress on us? Is it a warning, or an invitation, or a taunt? So this could indeed be box one of three, in this case Venus' box. What's your best guess? I'm gonna go with drive-through fast food, because I want to believe.